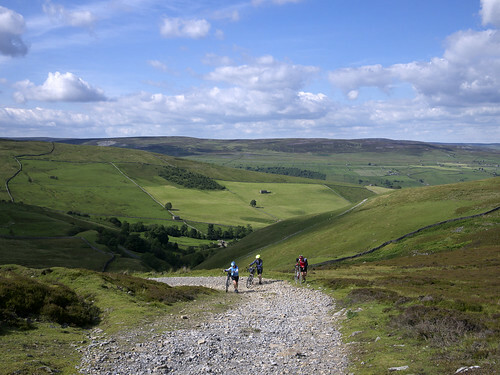 A weekend cycle tour in the Yorkshire Dales as originally described in The Cyclist magazine by L.G. Fothergill in 1937 became a one-day ride when CycleSeven met each other for the first time and cycled the route in July 2011. We were joined by my cousin Mike, and Dan Baritono from the CTC Forums. Mick F had cycled up from Cornwall, Alan from Cambridge, and Hilary, with Dennis, flown in from the Isle of Wight (Mary, Chris, Mike, Dan, and me and Sandra, are more local in varying degrees). So a Grand Occasion for challenging cycling in one of Britain's most stunning landscapes to retrace Fothergill's pedal strokes some 74 years later. And his footsteps: some of the original route is uncyclable (above) as we discovered at Summer Lodge on the climb out of Swaledale (to be fair, I'd been warned of this by Chris but had chosen to believe Google Earth). 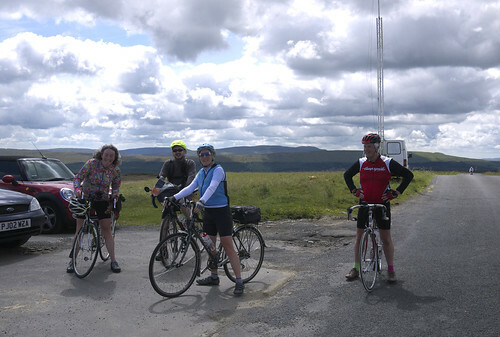 Six of us set off from Skipton at 8.30 am, meeting Mick F at Gargrave, and Chris had already cycled from Kettlewell. We arrived back at around 9.15 pm. It was just Mick F, Mary and me at the finish in Skipton as the long time required meant that we'd parted company with some of our friends for various reasons (Mike, my cousin, had actually completed the ride by then, having gone on ahead earlier in the day). For the next get-together we should probably organise something more convenient all round but it was an enjoyable meeting of cyclists and the weather was lovely. 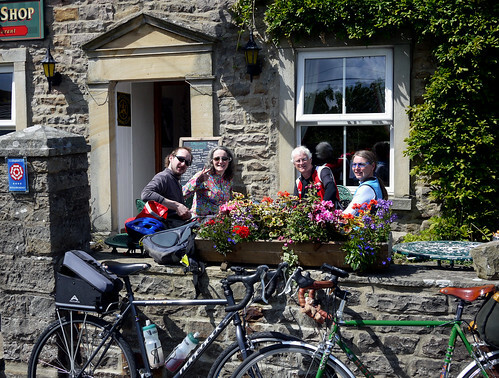 We stopped for cake at Zarina’s Tearoom in Kettlewell on the way north and at Muker Village Stores & Teashop for lunch (there's a CTC symbol – the old winged wheel logo – in the doorway) before we headed back east then south again. Both recommended for cyclists. Quite long stops due to excellent cakes and cheese. *There is a discrepancy of around 2,000 feet of climbing between Mick's GPS calculation and mine. My Garmin records elevation by satellite and I assume his is barometric and more accurate. I assume there is also some GPS under-counting of miles travelled on the road surface, because a GPS is measuring from high up in space and doesn't accurately record distance on steep gradients (of which there were several). I'm claiming a century ride, not 99 miles – I wasn't going to cycle one extra mile around the car park at Skipton Travelodge. Either way this was a tough ride for me. I wouldn't want to cycle further than 100 miles on hilly terrain such as this. I couldn't have driven the one hour home by car afterwards (Sandra drove). I was fine the next day though, reflecting on a superb cycle ride in very good company. PS: Apologies to Muker Village Stores & Teashop – I forgot to pay for one pot of tea and one cheese and tomato toastie. Will pay double next visit. Posted by Patrick on July 24th, 2011. I raised a glass to all last night, and I raise another tonight – I wish we could have been there. Thanks Kern. Another time maybe? I rested the day after (watched the final stage of Le Tour de France, which Cavendish won) but Mick F is still going strong on Day Seven of his Tour de Angleterre. And so is Alan. Its hard to imagine folk still going home isnt it! Glad Mr Sunshine is still with us, had we chosen the previous weekend things would not be quite so splendid and grand. My pictures are now on Flickr Patrick, if you want to add any of them got some nice ones of you guys all hard at the upward slog. It was the BEST cycling challenge I have done so far. Loved the route, the ride was all the better for such great company. So glad Dan came along as well, he knew so much about the area, the geography and history. I think Dan should become a fellow blogger on here, he does some ace rides. Soon to tackle Iceland! I was shattered once Id got back to Skipton and so pleased for the final 10 miles back to the Youth Hostel by Sandra, that saved my bacon. I was up early the following day, no aches or pains, but rather spaced out... I was ever so glad to see Lancaster, and the Trough of Bowland wasnt so hilly going towards Lancaster as it had been, cycling to Earby I managed it in 5 hours instead of 6. What a day..... FAN TAS TIC! I hope Alan puts a blog about this ride to and fro the big day, as he was biving (spelling?) the ride not going all soft like me and sleeping in a bed each night. LOoking forward to Mick and Hilarys input too. Mary wrote: And so is Alan. Indeed. Alan does not have an itinerary as such but as you say Mary, he is now en route in a generally southerly direction, or possibly east, or west (his words). I also second your comments about mystery man Dan. PS: Chris mentioned he might tackle the ride again later this week. Yes, I agree, a wholeheartedly wonderful and monumental ride and one I will never forget. I fell into the bar at the Old Swan when I made it back and sank four wonderful pints of Black Sheep Bitter. I didn't bother with an evening meal, just happy with the beer, and flopped into bed after a hot shower. TBH, I could have cycled further – I wouldn't know how further, but the evening was coming on. How people can ride 200miles I don't know, unless the terrain is flat, or else they'd run out of time! 70miles tomorrow down to Bedford, and another day off. Bike and Trailer doing fine, and so are my legs. A brilliant ride in great company. Hats off to Patrick, Mary and Mick who made it all the way and to Dan who probably cycled further than anybody. I have to admit I did find it hard. I'll never describe the Isle of Wight as hilly ever again! It has a series of small undulations! I really enjoyed the ride (apart from the panic attacks on the descents) but was happy to call it a day at Askrigg. A hard hilly 100 mile ride on a borrowed bike was always going to be a bit ambitious so all I was hoping for was an enjoyable ride in the Dales and I certainly got that. Many thanks to Sandra for kindly lending me her bike. It rode beautifully despite being a bit on the big side for me. We should definitely meet up for a ride again – tho preferably one on a slightly less epic scale! A marvellous, memorable day. 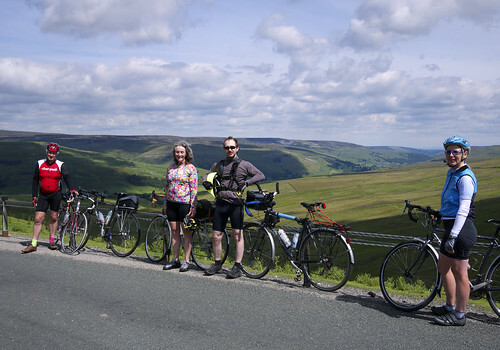 Remember I was only doing a 100km ride with Audax UK, so just from Skipton to Buckden. Time At Rest = 5 hours 20 minutes (includes all give way and halt signs as well as cafe stops). Puts the IOM into perspective, as I have a route here that is worth AAA 2.75 as well. 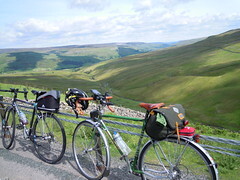 Thanks to Patrick for inviting me on a great ride in the Yorkshire Dales. Steep climbs, fast descents, superb scenery, perfect weather and interesting company (as far as the Kettlewell cafe stop) when I had to continue on my own, in the hope of being back in Lancaster for an evening party. I followed the same route as Patrick's except I avoided the "hike a bike section" by taking the second road east of Muker over to Askrigg ( very steep, rough surface in parts and 6 gates to go through) and, for the last few miles, followed the busier A65 from Bolton Abbey to Skipton as Chris had said route finding was difficult here and my map didn't cover it. 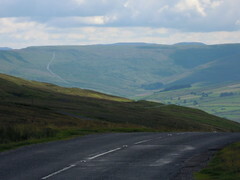 With the wind behind, I thought the section from Buckden to Appletreewick was very exhilarating. I arrived back in Skipton at 5.20pm and had a brief chat with Alan who seemed to have had a good day also. To cap off a great day I made it to the party on time where I enjoyed several Black Sheep, a meal and (limited) dancing. Hilary wrote: We should definitely meet up for a ride again – tho preferably one on a slightly less epic scale! A marvellous, memorable day. Seconded Hilary. I could not keep up with you on the climbs. You did well on an unfamiliar bike – riding your own bike makes a difference. Apologies for the scrambling up from Crackpot! And yes, Dan cycled further than anybody (115 miles and home by 9.50 pm). Mary, I see your total climb to Skipton was 3,554 metres. That equates to 11,660 feet. Amazing. It does suggest that Mick's altimeter (9,750 ft) was more correct than mine (7,533) for the actual 1937 route. Good news re the Audax. Well done. Mike, I'm pleased you enjoyed the ride. Well done too. At 5.20 pm when you finished I think we were still in Askrigg. The only thing is, around Buckden the wind had turned against us! Apologies for the scrambling up from Crackpot! Many thanks for a great day, and a great experience. I didn't even manage to do a century on the flatlands around home, so I knew I had no chance on the hills of Yorkshire. But it gave me a reason to try to get fit, and I'm certainly fitter than I would have been without it, so it has been very worthwhile for me. On the day I did 25 miles including part of Fothergill's route that you guys skipped. Today I did 50 miles, arriving home at 5.25pm. Piccies and blog will follow. Alan wrote: ... part of Fothergill's route that you guys skipped. Yes, the whole of Fothergill's route in one day would be a very tall order. I'm pleased your trip was worthwhile Alan, and you are now doing 50s. Glad you got home safe and sound Alan. It was a pleasure to meet you. Looking forward to reading your story of your adventure up North. You and your hip have come a long way, quite literally over the past year! I am off island for the next 3 weeks, so no blogging from me for some time. about your problem regarding the climbing difference: i think the barometric could indeed be wrong, regarding the sudden weather changes in the dales and hence, the changes on the air pressure, it wouldn't really surprise me. so gps, as far up as it might be, should be more exact than the barometric calculations. We drove the Cabot Trail (a loop) in Nova Scotia measuring altitudes based on the barometric reading of our bicycle computer. The altitude reading of our starting/ending location differed by more than 80 meters over the course of the 4 hour drive.